And finally, spring is here! I love this time of year, when the days grow longer, and the sun becomes warmer. Lately, I’ve been doing some spring cleaning on our systems, which resulted in new documents and an automated inquiry process through Dubsado. In the next few weeks, I’ll be ready to freshen the studio with a coat of paint (finally!) and make this home studio my own. I can’t wait to show you how much this room has transformed. In celebration, I assembled five color palettes to celebrate the spring season. I often get asked how the descriptive adjective selection on our brand questionnaire translates to decisions on design. One of the biggest factors is through color selection. Color adds so much personality to a brand, and can communicate interests and values in a subtle way. You’ll see that each of the palettes below shows a different side of spring based on the five adjectives I selected for each palette. With spring comes new growth, and as the daughter of an environmentalist, I recognize how important Earth Day is to the season. This palette is earthy and rugged, drawing on natural inspiration and communicating growth and new life. This brand would be sustainable, organic, and warm. Living on a ranch in Montana, I’ve seen just how much the flood gates open in the spring, swelling rivers and damning roads. It makes me remember the times I’ve gone to the beach in early spring and experience afternoon showers, which blanketed the world in a hazy, solemn mist. 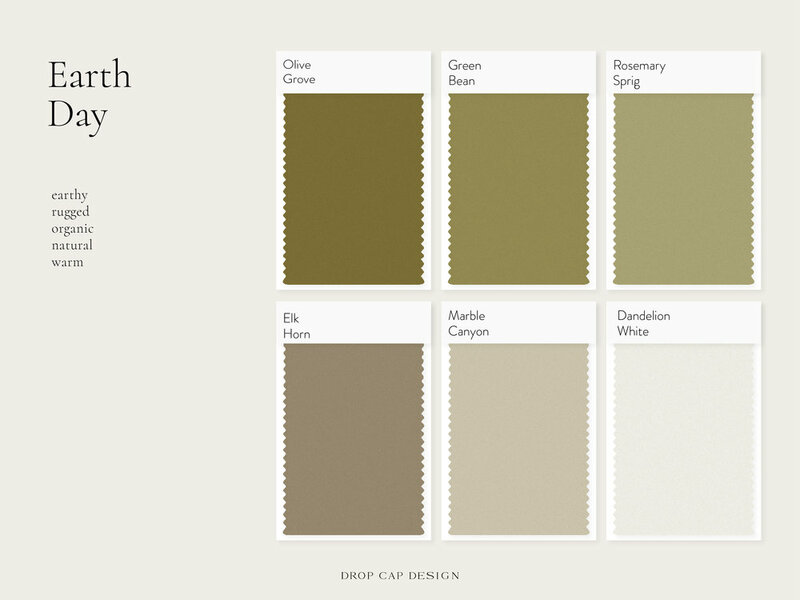 This palette is inspired by the clarity of spring, and muted tones of an afternoon thunderstorm - perfect for curling up on the screened in porch with a good book. A proper take on spring pastels, I am always inspired by a lovely manicured English garden. Colorful preppy hues lend a certain formality and politeness to a brand, but spring adds a youthful flair. A brand with this palette would have a knowledge and appreciation for etiquette, but also not take itself too seriously, walking through life with the grace and elegance of a freshly cut bouquet of English roses. Don’t we all love a fresh start, and a clean slate? I get the Magnolia Fixer Upper feels every time Spring comes around and I want to freshen up my home and banish the winter blues. Fresh paint, cut flowers, and clean counters give a comforting feel to a new space, just like a well-selected palette of neutrals. 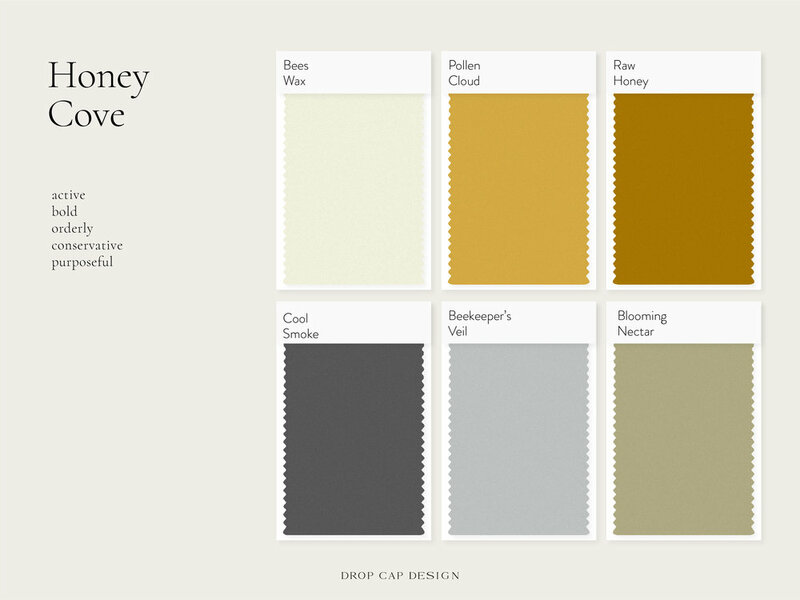 A color selection like this one is a fresh start, full of possibility. It’s as comforting as a clean kitchen, and gentle as a favorite chair. For some, the spring season is a time to work. As the flowers bloom, bees start gravitating towards fresh nectar. This palette is active and purposeful, working towards a common good. There’s a bold energy, but a conservative use of color, which makes for a vibrant combination. A brand with this palette would have a firm understanding of their vision, and go about building their tribe in an orderly way. And the sweet honey it produces would be well worth the effort. for the Spring 2019 season!